LAST WEEKS OF THE WILD WEST. Wonderful Success of Col. Cody's Great Enterprise. The last weeks of the Wild West exhibition at Ambrose Park, South Brooklyn, are announced to-day. There is no gainsaying the fact that Messrs. Cody and Salsbury have met with a great degree of success during their long stay in this vicinity, and it is none the less true that they have educated New-Yorkers and Brooklynites to such a point that any outdoor exhibition that may settle about our gates in future years will have to be a mammoth enterprise indeed, if it expects to meet with great success or throw into the shade the impressions left by the only and original Wild West. Constructed upon lines of originality and grandeur, the Wild West, as it has been presented every afternoon and evening all Summer, is an entertainment the like of which has never been seen in this locality before, and when its season is closed those who have not seen it will feel like those who went to other places rather than to the World's Fair only to regret their shortsightedness later. 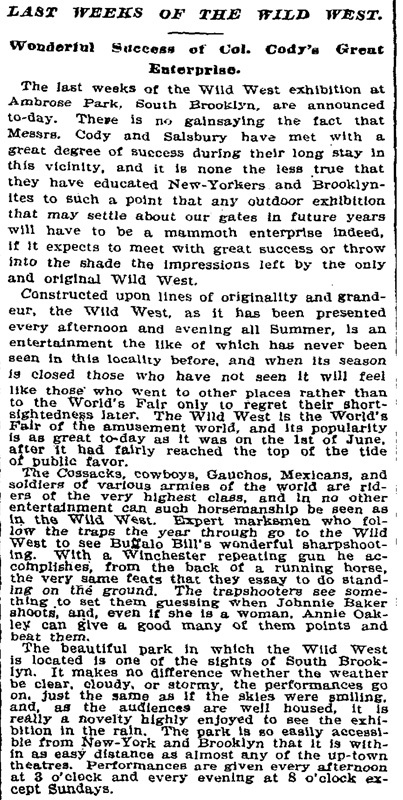 The Wild West is the World's Fair of the amusement world, and its popularity is as great to-day as it was on the 1st of June, after it had fairly reached the top of the tide of public favor. The Cossacks, cowboys, Gauchos, Mexicans, and soldiers of various armies of the world are riders of the very highest class, and in no other entertainment can such horsemanship be seen as in the Wild West. Expert marksmen who follow the traps the year through go to the Wild West to see Buffalo Bill's wonderful sharpshooting. With a Winchester repeating gun he accomplishes, from the back of a running horse, the very same feats that they essay to do standing on the ground. The trapshooters see something to set them guessing when Johnnie Baker shoots, and, even if she is a woman, Annie Oakley can give a good many of them points and beat them. The beautiful park in which the Wild West is located is one of the sights of South Brooklyn. It makes no difference whether the weather be clear, cloudy, or stormy, the performances go on, just the same as if the skies were smiling, and, as the audiences are well housed, it is really a novelty highly enjoyed to see the exhibition in the rain. The park is so easily accessible from New-York and Brooklyn that it is within as easy distance as almost any of the up-town theatres. Performances are given every afternoon at 3 o'clock and every evening at 8 o'clock except Sundays.